THE PRESIDENT: Thank you very much. Please. And thank you Chaplain Hurley. Thank you to Vice President Mike Pence for joining us for today’s ceremony. Today is a truly proud and special day for those of us here in the White House, because Ron works right here alongside of us on the Secret Service Counter Assault Team. These are incredible people. Several weeks ago, my staff asked Ron and his wife Miranda — thank you, Miranda — to a meeting in the West Wing. They didn’t know what it was about. They walked into the Oval Office, and I told Ron that he was going to receive our nation’s highest military honor. It was a moment I will never forget. Ron and Miranda are joined today by their two beautiful sons: Cameron, who is 10, and, Tyler, who is 7. Stand up. Look at these guys. (Applause.) Cameron. Tyler. We stand in awe of your father’s courage. We really do. Today, he joins the world’s most elite gathering of heroes. I want to thank, also, Secretary Nielsen for joining us — Secretary, thank you very much; along with Secretary of the Army, Mark Esper. Mark, thank you very much. Vice Chairman of the Joint Chiefs of Staff, General Paul Selva. Thank you, Paul. Army Chief of Staff, General Mark Milley. Mark, thank you. Commander of Special Operations Command, General Raymond Thomas. Thank you, Raymond. And Sergeant Major of the Army, Daniel Dailey. Thank you very much. Thank you very much, Daniel. I also want to recognize Representative Gerald Connolly, and Representative Dan Newhouse. Thank you very much for being here. Appreciate it. We are privileged to have among us five former recipients of the Congressional Medal of Honor: Bennie Adkins, Harvey Barnum, Gary Beikirch, Florent Groberg, and Brian Thacker. And thank you all for being here. Thank you. Please stand up. (Applause.) Thank you. Thank you very much for being with us. These are very brave, great people. Staff Sergeant Ron Shurer was born in Fairbanks, Alaska. He grew up in a military family, moving to four states before middle school. He graduated from Washington State University and applied to join the military, but was rejected due to a medical condition. I can’t believe they rejected you. (Laughter.) Boy, that was a bad mistake — (laughter) — but, they made up for it. Right? They made up for it. Soon after, America was attacked on September 11th, 2001. Determined to serve, Ron reapplied to the military and was accepted into the United States Army. He became a medic, and then he completed the grueling training to join the legendary ranks of the Green Berets. That’s a long way from not getting accepted the first time, right? That’s fantastic. That’s a great story. It was during his Special Forces training that Ron met Miranda. Just before Ron’s first deployment, they were married. Miranda was six months pregnant with their first son, Cameron, when Ron deployed to Afghanistan for the second time. Just a month before he returned home, Ron was called on a special operations mission. The aim was to hunt down a deadly terrorist — a leader in that world. He was in a remote mountain village. Very dangerous territory. On April 6th, 2008, Ron was among the few dozen Special Forces soldiers and 100 Afghan Commandos who dropped off by helicopter into Shok Valley –- a rocky, barren valley far away from reinforcements. There was nobody close. Ron was the only medic for the team. While he was still near the base of the mountain, the first team began to scale the cliff toward the village. As they approached the top, roughly 200 well-trained, and well-armed terrorists, ambushed the American and Afghan forces. Soon, Ron heard his comrade call his name. Ryan Wallen had been struck by shrapnel at the base of the mountain. He was very, very seriously hurt. But Ron braved enemy fire to rush to his friend and to treat his wounds. Then he heard over the radio that American fighters near the top of the cliff were pinned down and some were critically injured. There was blood all over the place. It was a tough, tough situation to be in. Immediately, Ron climbed the rocky mountain, all the while fighting back against the enemy and dodging gunfire left and right. Rockets were shot at him. Everything was shot at him. When he reached the top, one of his close friends, an Afghan interpreter, was already dead. Two Americans had been shot: Dillon Behr and Luis Morales. He treated them both to stabilize them and their condition. Ron threw his body on top of Dillon to protect him from shrapnel. One of his teammates, John Walding, was trying to protect the injured when he was shot, almost severing his leg entirely. As Ron was still rendering lifesaving aid to Dillon, he directed another soldier to help stem the bleeding. Then a bullet cut through Master Sergeant Scott Ford’s arm and struck Ron’s helmet. Ron said it felt like he had been hit on the head with a baseball bat. But he got up, and in pretty bad shape, bandaged Scott’s arm. Soon, Ron and his comrades used nylon webbing to lower the most critically injured down the sides of this really dangerous, and very steep cliff. When he reached the base of the mountain, Ron raced to each patient, giving them lifesaving care — they were bleeding profusely — and preparing them to be evacuated by helicopter. But Ron was not done yet. He charged back to the mountain — all the way up — and then rejoined the fight. For more than six hours, Ron bravely faced down the enemy. Not a single American died in that brutal battle, thanks in great measure to Ron’s heroic actions. Many of the warriors who fought in Shok Valley are here today. When I read your name, will you please stand? Thank you very much. We really appreciate it. He did a good job. Did he do a good job? Better say “yes,” now. Otherwise it’s too late. (Laughter.) We can always change our mind. (Laughter.) He did a good job. Thank you all for your noble service, and for being here to celebrate Ron’s historic achievement. It truly is that. As many of you know, a year and a half ago, Ron was diagnosed with cancer — tough cancer, rough cancer. But he has braved, battled, worked — he has done everything he can. That cancer — he’s been fighting it every single day with courage and with strength. And he’s a warrior. He’s a warrior. And just like he faced every single battle of his entire life, he’s facing a very tough battle right now with cancer. I already asked them that question. They needed no prodding. I said, “Is he a good father or a great father?” They said, “Great father.” Right? That’s good. CAMERON AND TYLER SHURER: Yeah, the best father ever. THE PRESIDENT: The best father ever? Wow. (Laughter.) That’s great. Beautiful, beautiful boys. And Ron, I just want to say, is an inspiration to everyone in this room and to every citizen all across our great land. Ron, our hearts are filled with gratitude and joy as we prepare to engrave your name alongside of America’s greatest heroes. 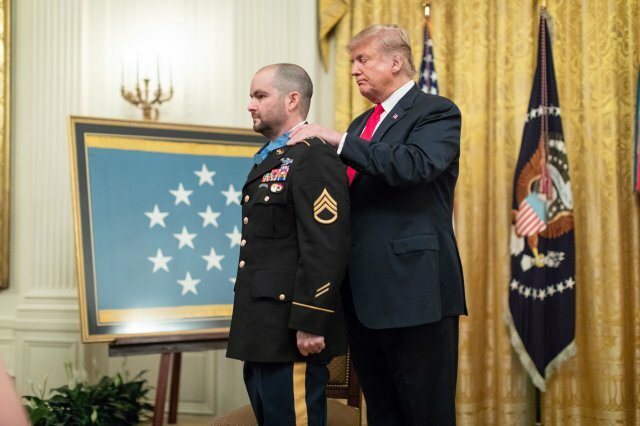 It is my honor and privilege, along with Mike and all of these incredible warriors in front of me, to present you with the Congressional Medal of Honor. I would like to ask the military aide to come forward and read the citation, please. Thank you. MILITARY AIDE: The President of the United States of America, authorized by Act of Congress, March 3, 1863, has awarded, in the name of Congress, the Medal of Honor to Staff Sergeant Ronald J. Shurer II, United States Army, for conspicuous gallantry and intrepidity at the risk of his life above and beyond the call of duty. Staff Sergeant Ronald J. Shurer II distinguished himself by acts of gallantry and intrepidity above and beyond the call of duty on April 6, 2008, while serving as a Senior Medical Sergeant, Special Forces Operational Detachment Alpha 3336, Special Operations Task Force-33, in support of Operation Enduring Freedom. Staff Sergeant Shurer was part of an assault element inserted by helicopter into a location in Afghanistan. As the assault element moved up a near vertical mountain toward its objective, it was engaged by fierce enemy machine gun, sniper, and rocket-propelled grenade fire. The lead portion of the assault element, which included the ground commander, sustained several casualties and became pinned down on the mountainside. Staff Sergeant Shurer and the rest of the trailing portion of the assault element, were likewise engaged by enemy machine gun, sniper, and rocket-propelled grenade fire. As the attack intensified, he braved enemy fire to move to an injured soldier and treat his wounds. Having stabilized the soldier, he then learned of the casualties among the lead element. Staff Sergeant Shurer fought his way up the mountainside, under intense enemy fire, to the lead element’s location. Upon reaching the lead element, he treated and stabilized two more soldiers. Finishing those lifesaving efforts, he noticed two additional severely wounded soldiers under intense enemy fire. The bullet that had wounded one of these soldiers had also impacted Staff Sergeant Shurer’s helmet. With complete disregard for his own life, Staff Sergeant Shurer again moved through enemy fire to treat and stabilize one soldier’s severely wounded arm. Shortly thereafter, he continued to brave withering enemy fire to get to the other soldier’s location in order to treat his lower leg, which had been almost completely severed by a high-caliber sniper round. After treating the soldier, Staff Sergeant Shurer began to evacuate the wounded, carrying and lowering them down the sheer mountainside. While moving down the mountain, he used his own body to shield the wounded from enemy fire and debris caused by danger-close air strikes. Reaching the base of the mountain, Staff Sergeant Shurer set up a casualty collection point and continued to treat the wounded. With the arrival of the medical evacuation helicopter, Staff Sergeant Shurer, again under enemy fire, helped load the wounded into the helicopter. Having ensured the safety of the wounded, he then regained control of his commando squad and rejoined the fight. He continued to lead his troops and emplace security elements until it was time to remove to the evacuation landing zone for the helicopter. Staff Sergeant Shurer’s actions are in keeping with the finest traditions of military service and reflect great credit upon himself, Combined Joint Special Operations Task Force-Afghanistan, Special Operations Command Central, and the United States Army.